I tried feeding BG using the airplane game. It worked for one spoonful. Ever. I did keep myself fairly amused trying on future attempts. You’d be surprised as to how much oatmeal you can do a barrel roll with! She was a little more interested when I started strafing the Japanese Cheerios though. While the Illuminated JetBib Feeding System does not depict a map of Guadalcanal, it does feature a runway that could have come off of an aircraft carrier. 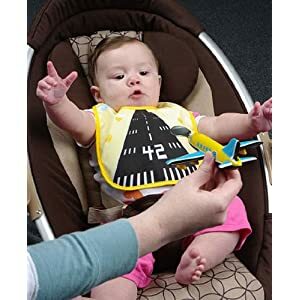 Even better, the runway is lined with motion activated LED lights that turn on when your aircraft shaped spoon swoops in for the inevitable crash with baby’s lips. Need betterer? The airplane spoon also lights up and has three swappable spoon attachments!